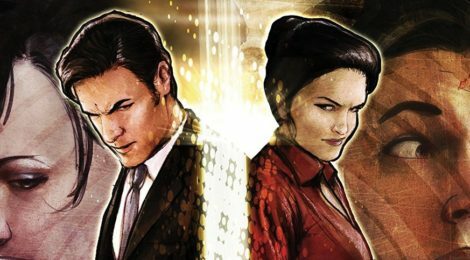 Comic Book Review - Crosswind Vol. 1 - Honk if you love justice! Crosswind is an Image series written by Gail Simone, drawn by Cat Staggs, with letters from Simon Bowland. The blurb at Image’s site describes it as “Goodfellas meets Freaky Friday” and it’s an apt description. What happens if a Chicago hitman and a suburban housewife switch bodies? Under Gail’s pen, you get vulgar, action-filled fun. Cason, the brutal mobster, has to clean up a mistake made by his boss’s son, while Juniper has to get a meal ready for her husband’s boss while navigating abuse from all sides. It’s bad enough BEFORE they get zapped into each other’s bodies, and have to regroup on the fly. Gail Simone is one of my favorite follows on Twitter, and her trademark wit is well used here. Cat Staggs’s art has an almost rotoscoped-realism to it, and I particularly love how she captured different mannerisms for Cason and Juniper after the swap. Crosswind is definitely worth a read if you like any of the above. Check it out on Amazon/Comixology.